Thank you to the current Corporate Partners above. 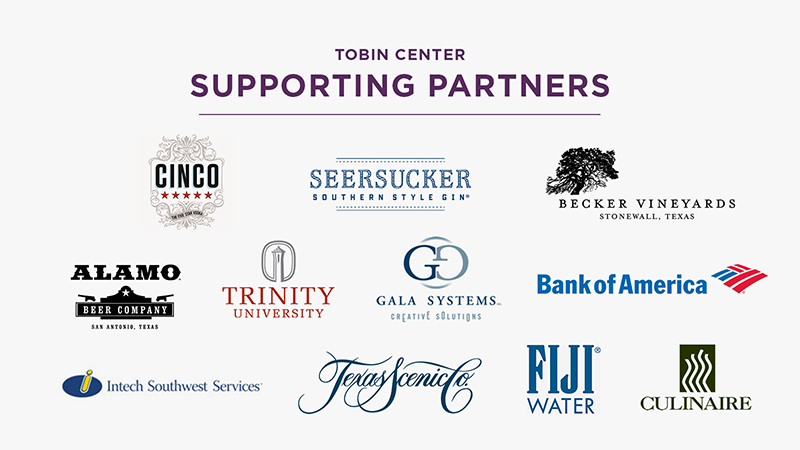 The Tobin Center for the Performing Arts offers a variety of ways for companies and their employees to become involved and engaged in the arts through either Corporate Membership or Sponsorship. Membership and sponsorship opportunities allow for your business to join our mission and continue to enhance our community. Whether you are interested in Membership opportunities that offer benefits to all your employees or Sponsorship which offers marketing and client entertainment opportunities for your company—we can create a custom package for you. For additional information on Corporate Partnerships* please contact Susie Walker-Atchison, Director of Development. *Sponsorship packages at varied levels are also available and customizable based on the goals and objectives of your organization, and can include high visibility, co-branding and engagement benefits.